Is the Bank of England fit for purpose? That was the topic for a Labour in the City discussion hosted by Cicero which provoked a vigorous debate from our expert panel. The Labour Party is openly calling for a change to the Bank’s mandate, by adding a target of improving the nation’s stubbornly slow productivity by 3% annually, alongside inflation targeting and promoting financial stability. The idea of this shake-up would be to get the Bank to adopt a more interventionist role and rebalance the way capital in invested in the economy. Think less lending for mortgages and real estate debt, more investment in faster growing sectors of the economy such as technology and sustainability. “Our approach stems from a keen awareness that things cannot continue as they are,” said Lord Tunnicliffe, Labour’s Treasury spokesman in the House of Lords, pointing to four consecutive quarters of falling business investment, lacklustre household savings, stagnant household incomes and broad disillusionment with the way the economy is working. Lord Tunnicliffe, standing in for Anneliese Dodds who was unable to attend due to knife-edge Brexit votes in the House of Commons, outlined how Labour’s policy programme would boost both investment, through a National Transformation Fund, and through the Strategic Investment Board which would channel capital more productively. Philip Aldrick, Economics Editor at The Times, told an audience of 50 LITC members that he saw merit in efforts to use the Bank of England’s powers more effectively. While he praised Graham Turner, the economist who came up with the plan – he also warned that the Bank’s independence would be compromised. Fran Boait, Executive Director of Positive Money, advocated a more radical approach, saying the Bank has run out of tools. Quantitative easing, she suggested, has created an asset bubble which has made the rich richer. She called for a more holistic view from Threadneedle Street, taking in multiple objectives including supporting a more balanced economy and, for example, taking into account climate change when delivering on its objectives. Andrew Sentance, a former member of the Bank’s Monetary Policy Committee, begged to differ, arguing that too much stall was being put in monetary policy to deliver these objectives and made the case that other policy measures such as fiscal policy were more appropriate. He argued that the Bank’s credibility was running low, due to a sustained period of rock-bottom interest rates and that adding more objectives may undermine it even further. He was critical of suggestions by Labour that RBS, under national ownership, could be used to pursue policy goals. 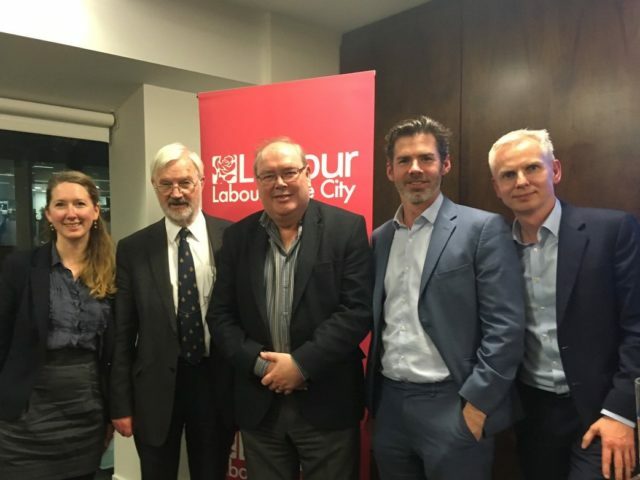 Hosted by Cicero, the event prompted a lively discussion and a pledge from Lord Tunnicliffe that the “mood of the meeting” would be fed directly back to the Shadow Chancellor, John McDonnell.